You know that understanding the details of how your accounts receivable department works is vital to the long-term success of your business. Without diligent attention, it can become one of the biggest financial headaches within your company. Accounts receivable can be handled in one of two ways: first-party and third-party management. This may seem self-explanatory; first-party means your company manages AR in-house, while third-party means you’ve outsourced to an outside company. This is true on the surface, but there is a secondary way to look at the issue. First-party accounts receivable management can also mean that a separate company handles your AR. To understand how this is possible, it’s important to look at the process of collecting on outstanding accounts, and at which stage first- and third-party management are best utilized. In the business world, it is inevitable that some of your customers will fail to settle their account in a timely manner. Some may need a gentle reminder or two, while others may need to implement a repayment plan to meet their obligation. Others will simply not pay at all. You know that the longer your company goes without recouping those funds, the harder it is for your cash flow to remain healthy. If your company is looking for a streamlined approach to collecting on overdue accounts, you can enlist the help of an outside company to handle both first-party and third-party management. When the account is only slightly overdue, first-party management is recommended. This is when all communication with the customer appears to come directly from your company, even if a separate company is handling it. First-party management is about trying to cure an account or prevent a loss, so early intervention is crucial. The treatment of accounts worked first-party and in a pre-charge off situation, is often the same. At TSI, our goal is to become an extension of your back-end operations, streamlining the first-party collection process for you. Your branding and communication guidelines are strictly followed. Reminder letters and calls are common during this stage. We strive to maintain a relationship with the customer and help everybody reach a workable solution. The decision to move to third-party management is usually due to the failure of a customer to respond to earlier messages. People commonly refer to this stage as ‘being in collections;’ communications are now coming directly from a separate company. The third-party is still acting on behalf of your business. Post-charge off work would also fall under this stage. With third-party management, other tactics can now be used to locate the customer and bring the account up-to-date, aiming to instill a sense of urgency in the debtor. Third-party management is often more regulated than first-party and is always covered under the FDCPA (Fair Debt Collection Practices Act). Ultimately, third-party management is about liquidating the total balance written off, and TSI can help. Our diplomatic process is designed to maintain a positive relationship with the customer while encouraging them to settle their account quickly. We utilize our proprietary data analytics platform and collection tactics including skip tracing, credit bureau reporting, and bankruptcy monitoring to increase your liquidity rates and develop more accurate revenue forecasting. But the real value of our operations is in our people. You can rely on our seasoned collection experts to work diligently on your behalf, backed by extensive training and support. Working together with a partner from the early stages can benefit both you and your customers. It allows the partner to become familiar with an account in receivables right from the beginning, so they can better judge if and when to move an account from first-party to third-party status. It also relieves the burden from your in-house staff of having to chase down overdue accounts. Your team can focus on other areas of the company to keep operations running smoothly, knowing that a trusted partner is acting on your behalf to bring your accounts receivables up to date. Finally, you can develop a customized approach to give your customers an integrated experience, which could result in a higher percentage of accounts being settled during the early stages. TSI is committed to providing personalized services to your customers, maintaining and enhancing relationships while helping you recoup lost revenue. Our integrated collections platform combines best-in-class technologies with data-driven workflows to facilitate effective and compliant operations for our clients. Contact me today to explore your options. If you sell products or services on credit, then chances are that the words “accounts receivable” are enough to give you a headache. Nevertheless, successfully managing your collections department is critical to your growth as a business. Recent numbers suggest that uncollected receivables could cost your company into the hundreds of thousands of dollars. Plus, surveys show that most businesses aren’t that great at staying on top of them. Let’s take a closer look at how much your collections are costing your business, and what you can do to fix it. Not only is value lost on the money owed, but overburdened AR departments can cost your company in other ways. Increased workload, reduced productivity and resorting to bank debt to maintain cash flow are all symptoms of poor collections practices. On average, companies write off 1.5% of their receivables as bad debt. 93% of businesses experience late payments from customers. 47% of credit sales are paid late. Average payment terms are 27 days, but actual payment period averages 34 days. Survey participants see maintaining cash flow levels as a key challenge that is critical to business profitability. Clearly, your accounts receivables could be costing your business a sizeable sum. However, there are a few best practices that you can implement today that will help to tighten up your collections department and allow you to put money back into your business. The first step is to calculate your average collection period. This will give you a clear idea of the number of days on average it takes for your business to see receivables turn into cash. Days in Period — This can vary; it could be 365 days or 90 days; whatever works best within your business. The key is that however long this period is, all other parts of the formula must span the same number of days. Average Accounts Receivable — Using the period of time established above, total the accounts receivable both at the beginning and at the end of the period. Then divide it by 2. Net Credit Sales — This is the total of your gross sales minus the total of all returns during the set period. For example, Company XYZ sees that their outstanding account receivables sit at $30,000 at the beginning of the year. By the end of the same year, they have risen to $36,000. Net credit sales came to $100,000 by the end of the year. According to the math, it takes an average of 120 days for Company XYZ to see their account receivables resolved and translated into all-important cash flow. We are dedicated to helping companies collect their accounts receivable while maintaining customer service excellence. Our years of experience can help you streamline the process of debt collection, now and for the future, while optimizing cash flow and increasing productivity in all areas of your business. Contact me today to learn more. Are you having a hard time finding the time to contact your customers or patients regarding payments? 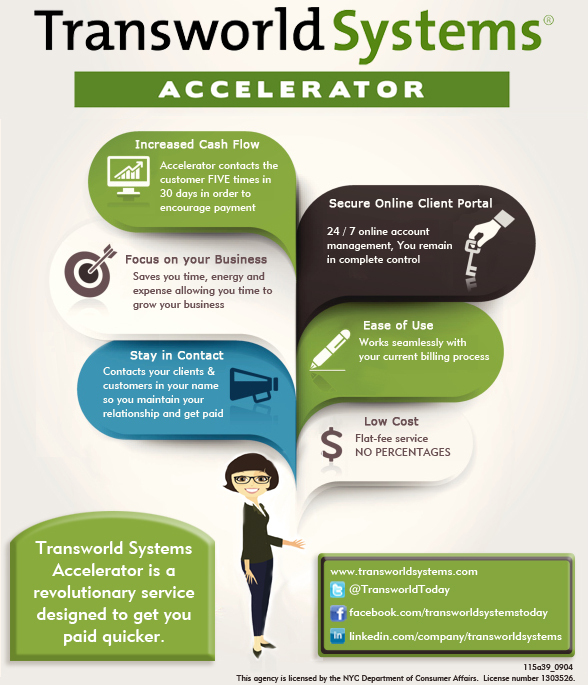 Let Transworld Systems help you Accelerate your payments and improve your cash flow with Accelerator. The below infographic illustrates the benefits of Accelerator and how we can help you get paid faster! Don’t wait until 60, 90 or 120 days for you outstanding invoices. The sooner you react, the sooner you can get paid the money you are owed! Call me, David, directly at 888-780-1333 for a free overview of the tools that can help you motivate your customers and patients to pay you sooner, while maintaining your good relationship with them. If your business/practice doesn’t systematically invoice and bill, start now. Many times bills aren’t paid simply because the customer/patient hasn’t been billed or reminded in a timely manner. Monthly statements aren’t enough anymore. Each customer/patient should be reminded at the least every two weeks. The lack of accomplishing this often occurs in smaller or newer businesses or practices where there isn’t enough staff to handle the invoicing and billing properly. If staffing or the cost of regular systematic, frequent follow-up is an issue in your case, help is available to get it done in a economical manner. With our economy today, there is no replacement for getting this done one way or another.